This picture shows the difference between the 1973-77 Regal/Century console(lower) and the one found in the 1970-2 Skylark(upper). The 73-77 console is identical to the earlier version with the only difference being the height of the lower section from the stainless steel beltline to the carpet. You can use the upper portion of the 73-77 shifter but the lower portion will not work. The cable from the 73-77 will not work in the earlier Skylarks. In order to make the 73-77 console fit your 70-2 Skylark, you will need a jig saw with a 6 teeth-per-inch blade. 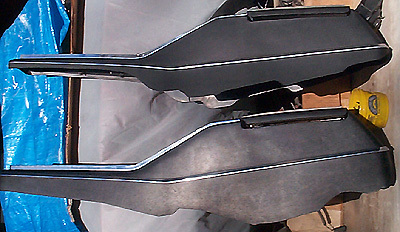 The front and rear arches of the late model will have to moved "up" closer to the stainless steel belt line. The crest of the arc is 1/4" from the stainless belt line. Use a lid from a 5 lb coffee can to trace the new arc in its new location. If you don't have a coffee can lid, make a cardboard circle with a 6 and 3/16" diameter. For the first 14" --- 3/8"
1" --- 7/8"             12" --- 1 15/16"
2" --- 1 5/16"          13" --- 2"
3" --- 1 1/8"           14" --- 2 1/8"
4" --- 1 3/8"           15" --- 2 1/4"
5" --- 1 1/2"           16" --- 2 1/2"
6" --- 1 3/4"           17" --- 2 9/16"
7" --- 1 7/8"           18" --- 3 1/8"
8" --- 2 1/16"          19" --- 3 3/16"
9" --- 2 1/4"           20" --- 3 3/16"
10" --- 2 1/2"           21" --- 2 1/4"
11" --- 2 1/4"           22" --- 2 1/4"